This time we live in. Despite all the bad that happens all over the world, there are also good things that connect us. Thank you Rebecca! Your posts made me so happy! 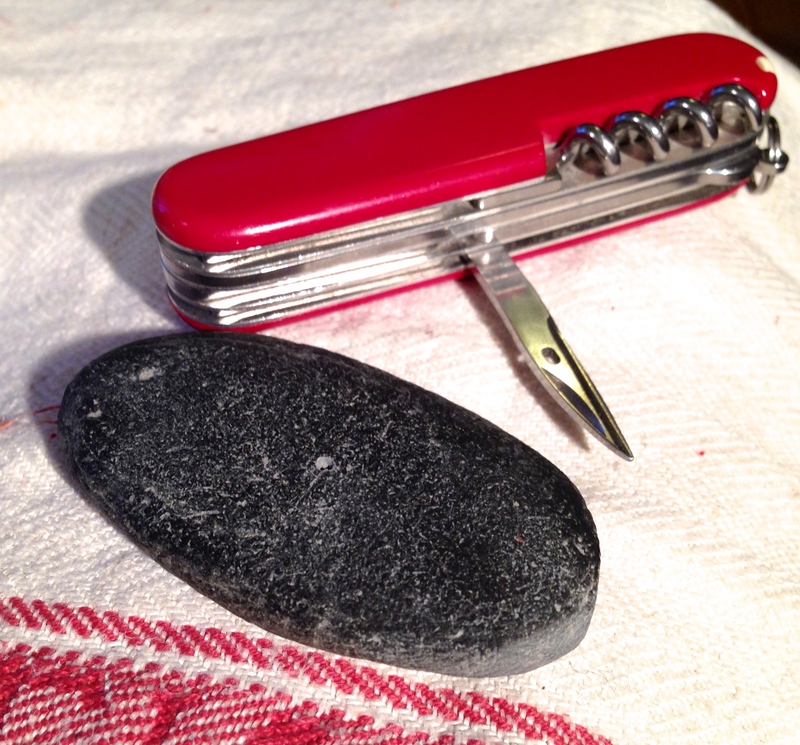 First you need to search your house: is there a suitable stone hidden somewhere? When you’ve found one, try to figure out how to start working. 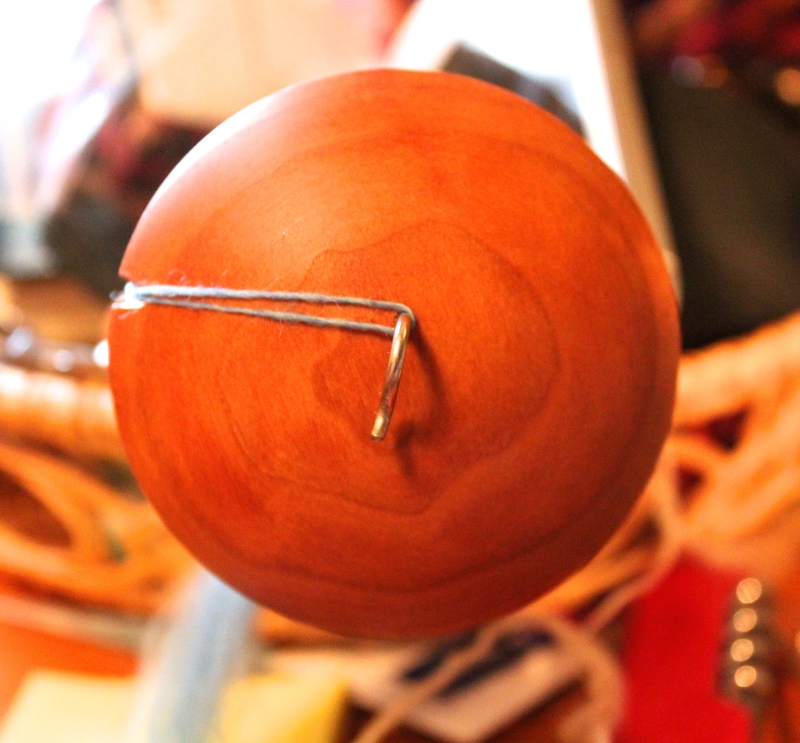 I chose to make the hole first, because without a hole it wouldn’t be much of a spindle. The hole also needs to be exactly in the center, and I thought it would be easier to work around the hole than to try to find the center of a circle, if you see what I mean. 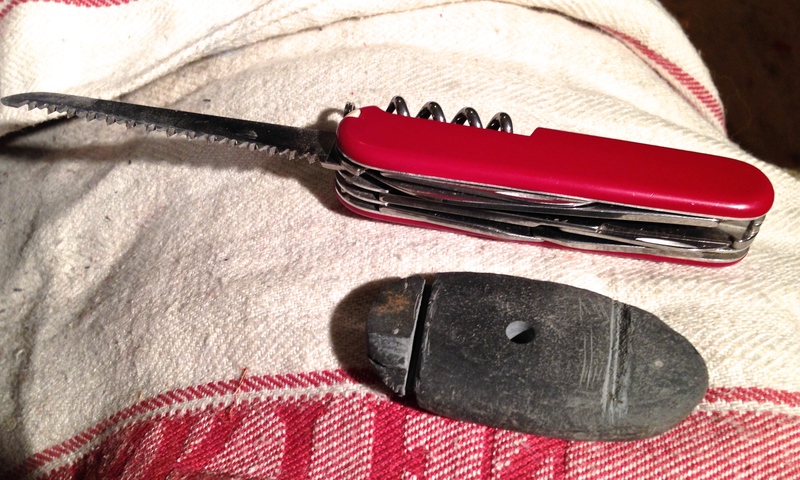 So my nice Swiss multipurpose tool, a crafter’s best friend by the way, came in handy once again. 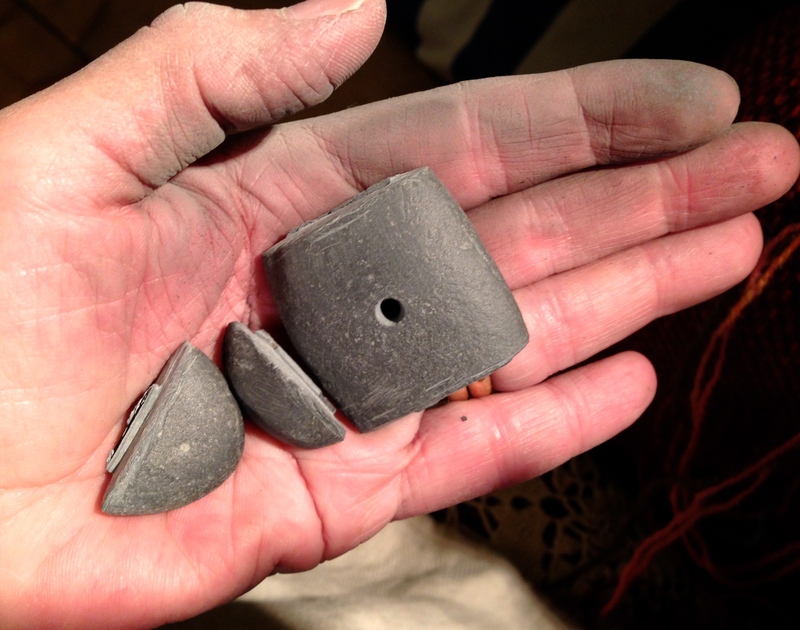 Then I took my coarsest sandpaper and a rasp and worked on the corners to make a somewhat circular shape, and also thinned out the thicker parts of the stone. 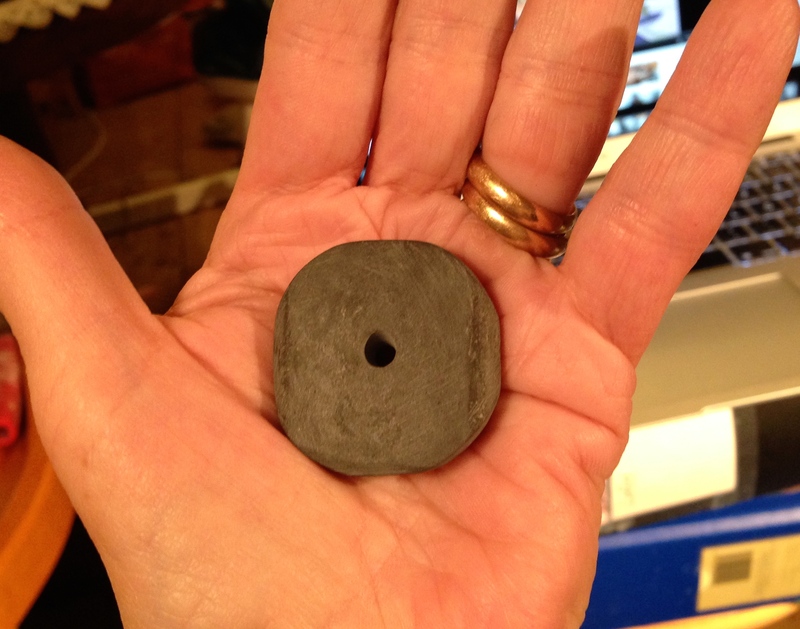 It doesn’t matter if the whorl isn’t perfectly circular, as it’s a supported spindle. Then it was time for the shaft. I wanted a Russian style shaft. So off to see what I could find in the firewood supply. I found birch, which is what to expect here where I live. Not hard enough, but will do. I can always make a new shaft when the old one is worn out. I used the biggest knife blade and the same coarse sandpaper, as I have found that very smooth shafts don’t give you the best grip because they’re slippery. 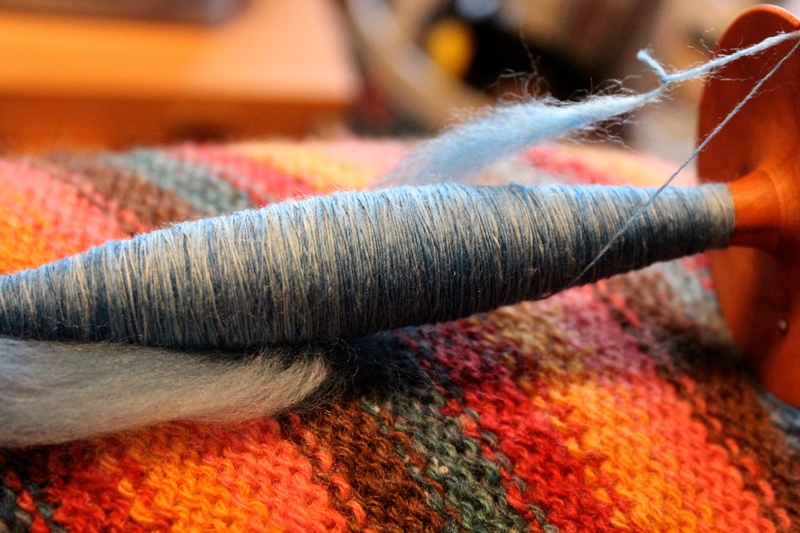 I test spun cotton, and the spindle was good! I’m satisfied with the result. The spindle rotates quite fast. 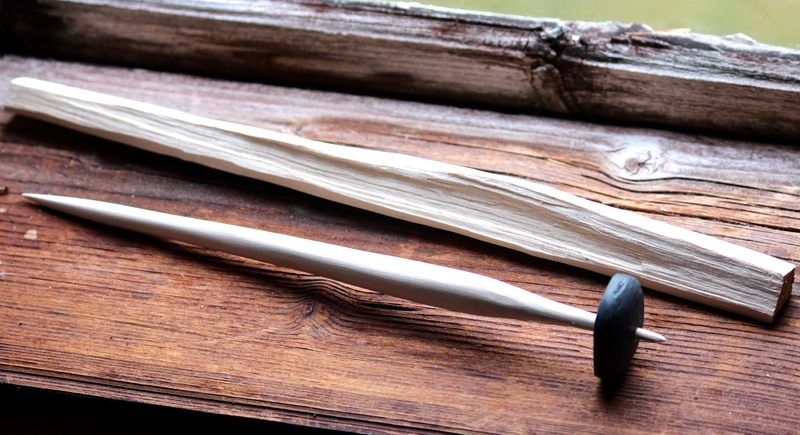 The whorl + shaft weighs 23 grams and it’s 25 cm long. I may try other types of shafts later, but for now I feel like I shouldn’t do any more woodwork. Wood is one of the materials that may swallow me, and I really don’t have time for that! I have this obsession with taking spindles with me when travelling. 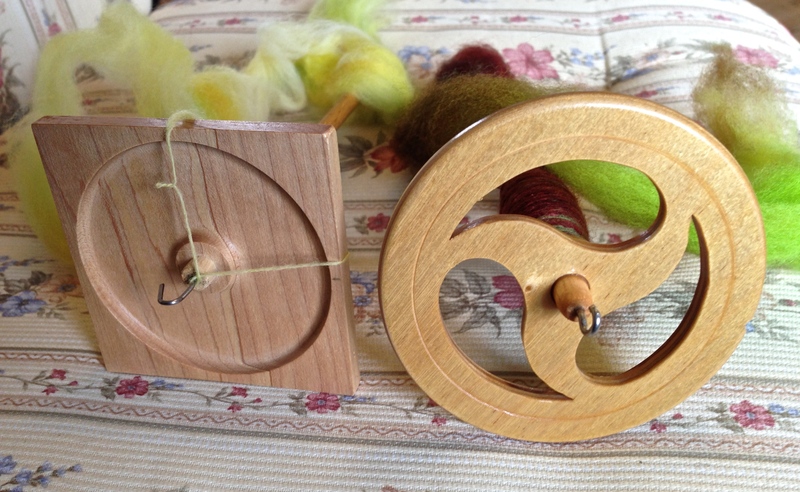 I have loads of purses, but these two spindles with big whorls haven’t had any earlier. Now they have one! Square spindle from Michael Williams, Comet from Woolly Designs. Both are perfectly balanced with long and fast spin. Tapestry crochet, yarn Sandnes Garn Mandarin Petit. Lining polyester, I think. Card woven strap in Mandarin Petit. Old rag rug gifted by a kind neighbour. 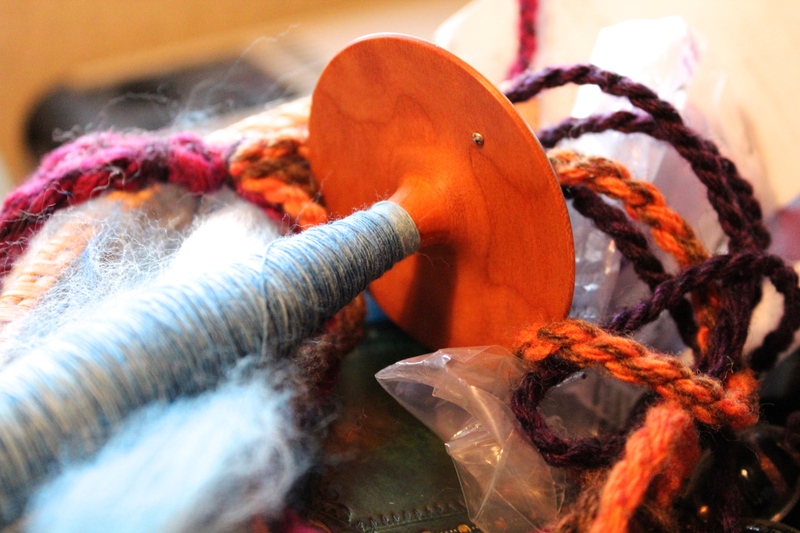 I have been spinning also. I started this yarn at a training camp on Ravelry before Tour de Fleece, and finished it a few days ago. Spun on three different light weight spindles and Louet Victoria. 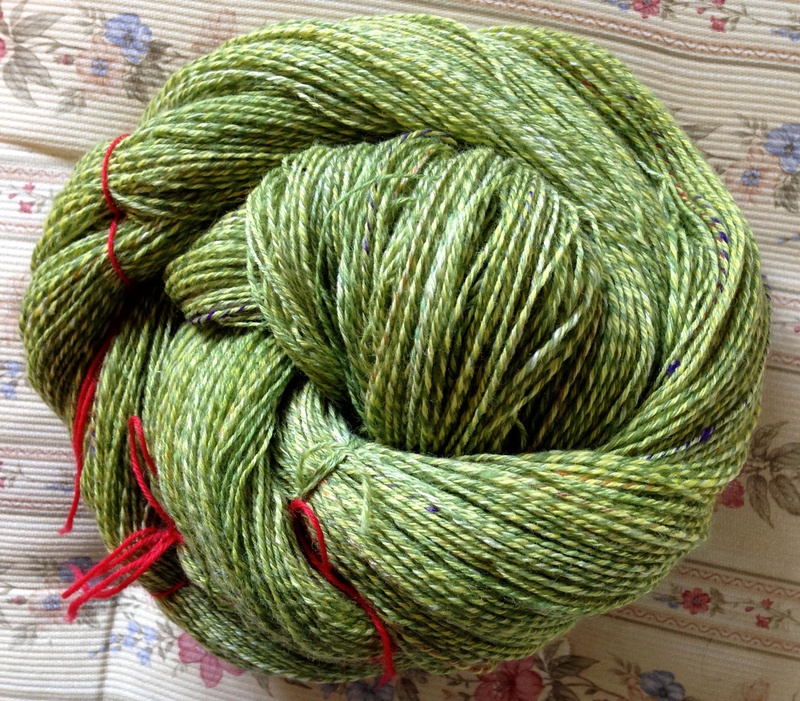 Sock yarn, 4-ply, 697 meters, 200 grams, merino and silk. I think for needles 2 mm, but still have to swatch. These are two techniques I’d like to learn properly. I’ve nalbinded every now and then for years, but I seem to land in the same stitch every time. I don’t know the name of it, but it’s a thumb stitch. 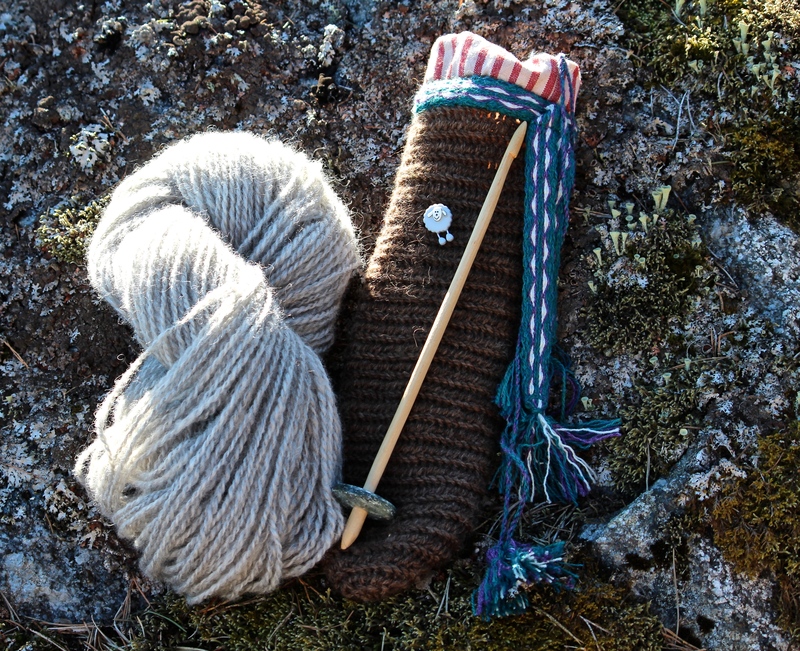 I used a handspun yarn (Värmland sheep) to bind a purse for the “stone age” spindle I bought at Shetland Museum in Lerwick. I use this spindle supported, but it can be used as a drop spindle also. It’s a favourite. The band is one of my first card woven bands. The pattern is from a Finnish book, “Lautanauhat” by Maikki Karisto. The teal yarn is handspun (British Longwool blends, commercial top), the white is handspun silk (brick), and the lilac is a commercial wool blend yarn. 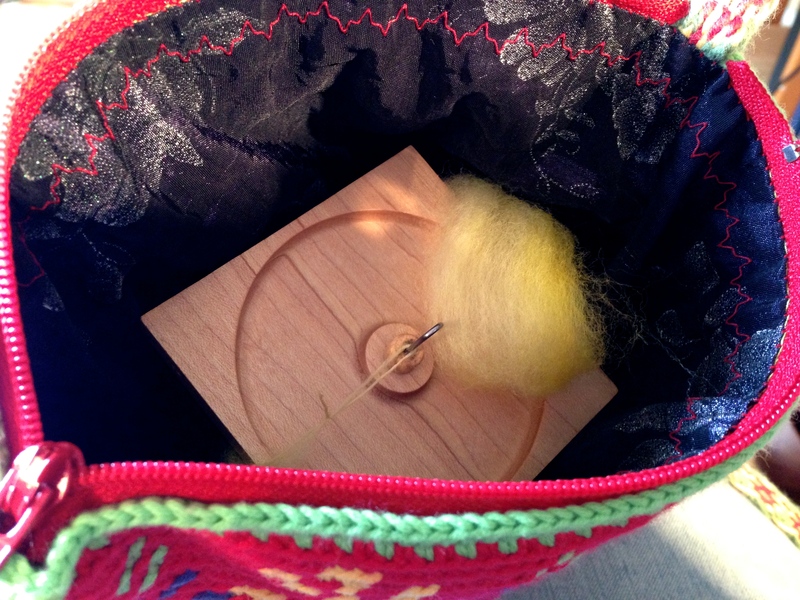 The little sheep button is a gift from someone. I’ve forgotten from whom I got it, so if you see this, please shout! 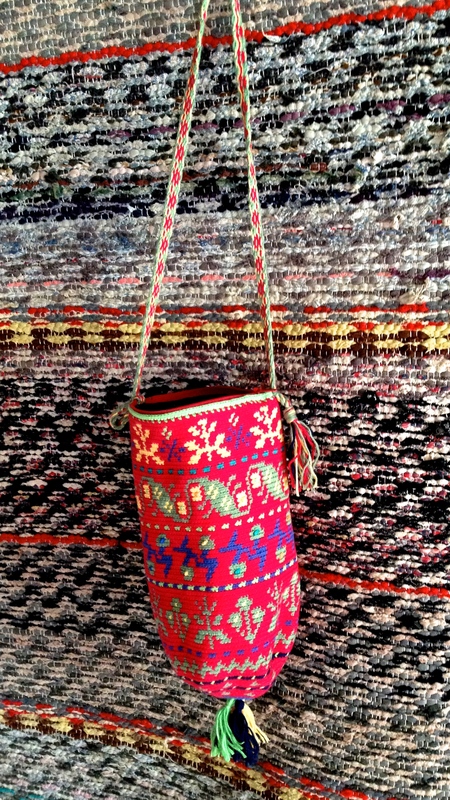 I think I’ll add a tassel to the bottom of the purse also. I spun the yarn on the Lerwick spindle. It’s Åland sheep, from one of the sheep I showed in an earlier post. The wool is very soft with almost no guard hair, and as I spun it lofty and quite thick, the yarn is super soft. I’ll use it in nalbinding that I will felt. Maybe mittens? A hat?